KIHEFO is currently employing a holistic, multi-pronged approach to removing the barriers to maternal health in the Kigezi region of Uganda. KIHEFO’s existing maternal healthcare programs and services, are seeing positive results amongst women who are participating, The antenatal and maternal services has promoted Health and increased maternal knowledge among pregnant women and mothers in Kabale. the addition of an ultrasound imaging technology program – whereby free services are brought directly to pregnant women living in rural communities. Early diagnosis of multiple fetuses (twins) and any pregnancy complications has helped the woman and her partner to plan ahead and make informed decisions as to where they give birth. excited when we announced that we would start delivering at the beginning of March 2016. By 15th March 2016 Three babies have been delivered so far. USAID is training the midwives on critical life saving skills. After several years of continuous efforts towards achieving this goal we have finally made it. Without the critical part played by Change for Children we would still not be able to achieve this long awaited output. FIRST BABY DELIVERED IN THE HOSPITAL. Access to health care. She attended antenatal care for seven months because of the free ultrasound scan project for the poor women. She had no body to help her because the husband is a casual laborer who leaves home very early in the morning and comes late at night. They were not even prepared to receive their new baby as evidenced by her coming with an empty hand when she went into labor contractions. She did not even have the basic kit for all mothers to deliver that has sterile gloves, polythene sheet, cord ligatures and cotton wool. This kit costs about 5 US dollars and all pregnant women are advised to buy them in advance and come to the hospital with the kid. The Midwives and excited KIHEFO volunteers contributed money to buy the baby sheets and a few clothes for the baby. The husband arrived at midnight only to find a bouncing baby girl. 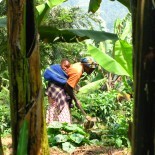 There are many women who face similar situations both in the rural and urban areas. We are happy that the hospital is serving exactly the intended. At the moment we are negotiating with of Health and USAID to pay salaries for the three midwives supply delivery kits and recruit additional two midwives to make then five as the number keeps growing. Everybody is very grateful with the support from Change for Children without which this noble cause would not be achieved. This entry was posted on March 2, 2016 by KIHEFO in Welcome from KIHEFO.